The dozens of fires burning across the West and Canada have blanketed the air with choking smoke from Oregon, where ash fell on the town of Cascade Locks, to Colorado, where health officials issued an air quality advisory alert. A fire in Montana's Glacier National Park emptied the park's busiest tourist spot as wind gusts drove the blaze toward the doorstep of a century old lodge. 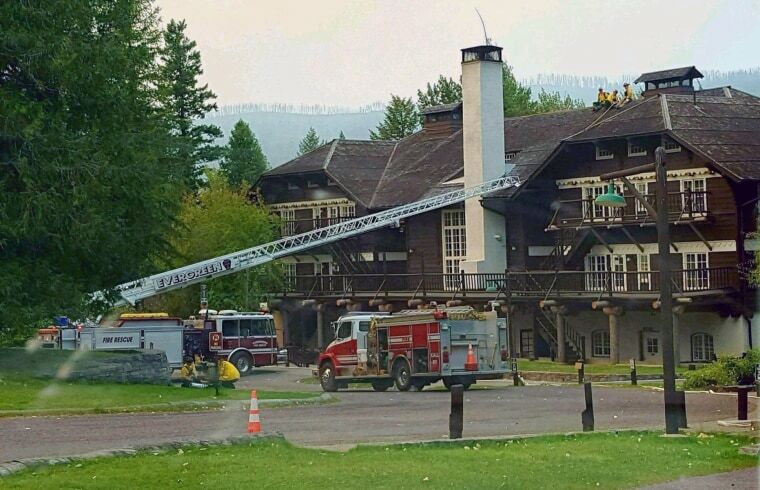 The 14-square-mile (36-square-kilometers) fire that consumed a historic Glacier backcountry chalet last week was about a mile away from Lake McDonald Lodge, a 103-year-old Swiss chalet-style hotel. The lodge's setting on the lake as the Going-to-the-Sun-Road begins its vertigo-inducing climb up the Continental Divide has made it an endearing park symbol for many visitors, and it's the jumping-off point for hikes, boat rides, horseback riding and tours in old-fashioned buses known as jammers. Rangers evacuated tourists and residents from 55 homes near the lake on Sunday as firefighters laid hoses and sprinklers around the hotel. On Monday, fire crews got bad news: The wind had shifted and gusts were driving the fire down the mountainside toward the lake's shores. Losing Lake McDonald Lodge on top of the destruction of Sperry Chalet last week would be "unimaginably devastating," said Mark Hufstetler, a historian who worked at the lodge for several years in the late 1970s and early 1980s. "These are some of the most remarkable buildings anywhere in the United States and they are an integral part of the Glacier experience and the Glacier tradition," Hufstetler said. "If they did not exist, that experience and that tradition would not exist, either." "It's important to all of us and a very high priority to do whatever we can to preserve that," she said. Outside California's Yosemite National Park, a wind-fueled fire on Sunday drove deeper into a grove of 2,700-year-old giant sequoia trees. Officials said the fire had gone through about half the grove, and had not killed any trees. Giant sequoias are resilient and can withstand low intensity fires. The blaze burned low-level brush and left scorch marks on some big trees that survived, said Cheryl Chipman, a fire information officer. "They have thick bark and made it through pretty well," Chipman said. There are about 100 giant sequoias in the grove, including the roughly 24-story-high Bull Buck sequoia, one of the world's largest. Fire crews also wrapped 19th-century cabins in shiny, fire-resistant material to protect them from the flames. The fire threatening the grove was one of several in the area — one of which closed some trails in Yosemite. A road leading to the park's southern entrance was also closed. Brenda Negley woke up Monday in her Oakhurst home 14 miles away and found her truck covered with ash. Her mother was there, too, after evacuating her own home, but Negley's thoughts were with the peaceful and secluded grove that she has regularly visited since childhood. "I've been sick with worry over Nelder Grove," she said. "As much as Nelder Grove is my home, and I don't want to lose my home, I want to save my mom's home and everyone else's home."